So, i woke up this morning and was pleasantly surprised that Brandon remembered my birthday! He even went as far as to give me my birthday gift BEFORE nine p.m. 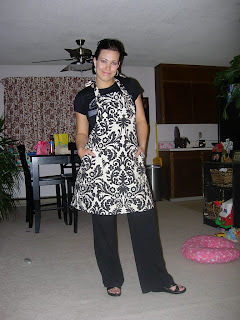 I had seen these cute aprons online and was soooo excited when I opened it up and found one! Brandon decided to throw me a barbecue with my playgroup pals, it was great. We had so much good food, and Brandon even managed to escape a small grill fire, yeah for him! He cooked me his famous shish-kabobs, yummy. He has this secret sauce he bastes them in and it's too die for. we also did grilled pineapple, congratulations korbi for tasting it, I'm so proud of you! we had some really yummy salads also. Katie was great and made my cake, which was a cheesecake, and it was DIVINE! I loved those little white chocolate chips, yum. Brandon also made homemade root beer, one of our summer favorites. 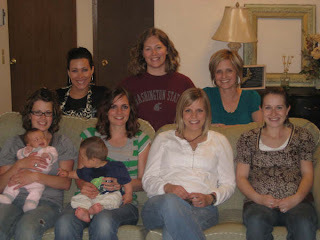 After appetizers, food, and dessert, we managed to get ourselves to the couch for some pictures. might I say, we are a lovely bunch! I really enjoyed my birthday, thanks to all who helped make it special. one year older, and wiser too? happy birthday to me!